The Argyle complex on a Saturday night has definitely got the clubbing vibe happening. This is where Ananas Bar & Barasserie is located. The decor is somewhat french boudoir meets pop culture and pop art. 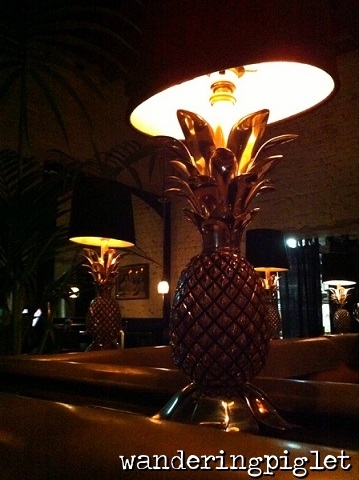 Love the eclectic collection of light fixtures and fittings throughout the restaurant with pineapples popping up at every view point. (Oh and on a side note, go have a peep in the toilets. The men’s features bright pink rolling stones lipped urinals (yes I tip-toed into the men’s loo) and the women’s has flamingo printed wallpaper and theater mirrors encrusted with gold pineapples. The front half of the establishment looks more like a bar, but the back half has more of a restaurant feel. They first come around with soughdough or rye bread, which is lovely and fresh, and goes so well with their lovely aerated butter. 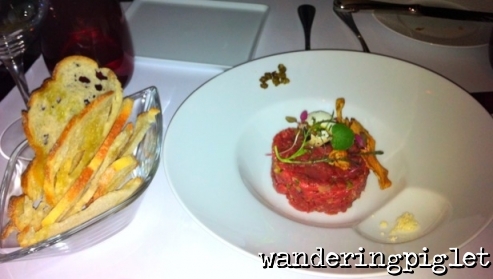 We ordered the classic hand cut steak tartare ($24/$36) first, actually the first steak tartare I have ever eaten. It was exceptionally well done. 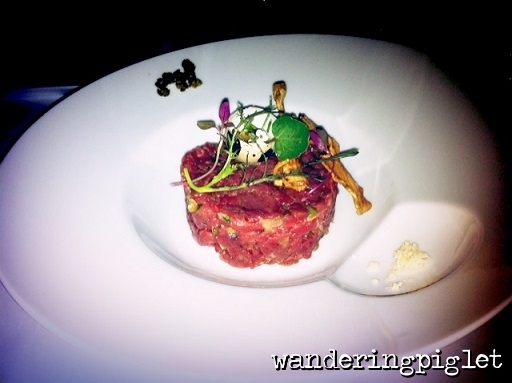 Well seasoned, with half a quail’s egg to mix through, as well as the edible flowers, which added texture and some crunch. This went well with the toasted slivers of bread. Next we had the lobster ravioli, confit tomato & bisque ($25/$33)(main portion photographed below) and the braised lamb shoulder ($34). 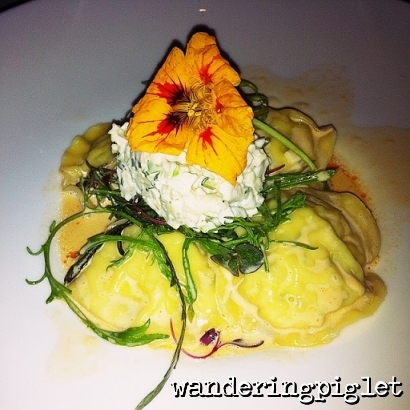 I did not regret getting the lobster ravioli. Beautifully presented, the re-freshing apple salad on top goes so well with the lobster packed ravioli, lobster bisque which is not too strong it just has a hint of lobster taste, and tomato bisque which adds a slight acidity and tartness to round off everything going on in your palate. 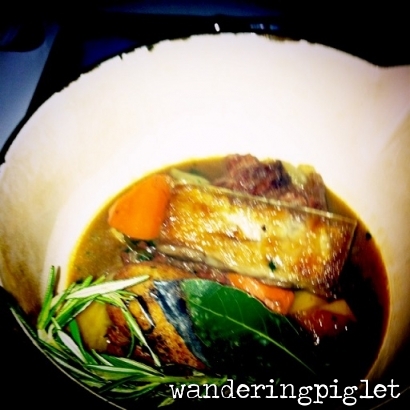 The lamb, was tender and fell apart from the bone, and is a great winter warmer dish. Next was dessert. 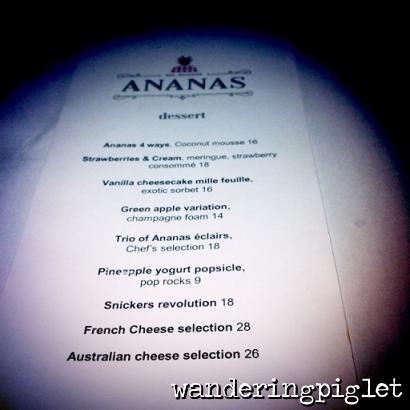 We ordered the Ananas 4 ways with coconut mousse ($16). Trio of Ananas eclairs ($18) and the Snickers revolution ($18). 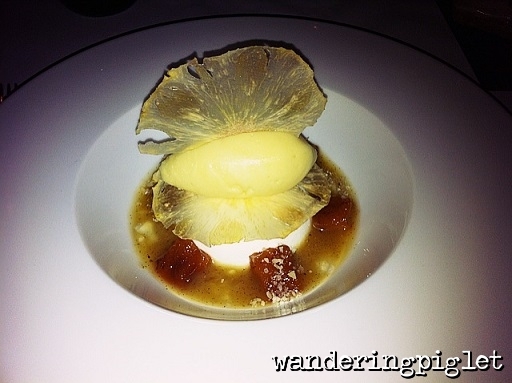 The stand out for me was without a doubt the Ananas 4 ways with coconut mousse. Just delicious. All the elements went well together and were great individually as well – pineapple sorbet, dried pineapple crisp, stewed pineapple and pineapple jus. Definitely a star and reminds me of the Chatterbox’s coconut ice-cream (Restaurant at the Mandarin Orchard hotel in Singapore). The snickers revolution was indeed just like a deconstructed snickers bar. 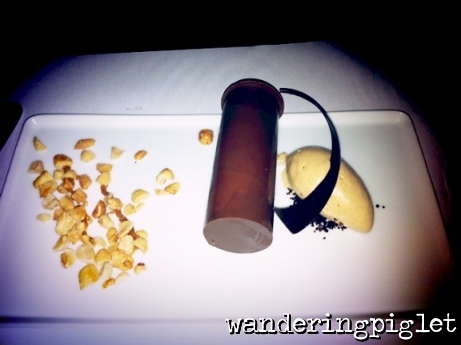 A delicate chocolate tube filled with chocolate mousse, and peanut/salted caramel ice-cream. Well executed, but I wouldn’t go out of my way to order it again. 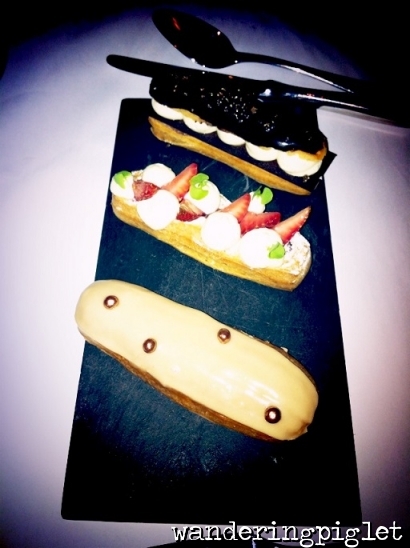 The Trio of Ananas eclairs was great though, particularly enjoyed the chocolate eclair, very delectable! The other two featured on the plate are fresh strawberries and cream, and salted caramel.